In a panic, the guys head to Dale's girlfriend's home, in an upscale neighborhood, to warn them that the murderers might be heading their way. But when Dale gets there (after dark), he finds her family has been waiting for him for their scheduled dinner together. He manages to create an insane scene, which climaxes when the father (Ed Begley Jr.) pulls a gun and starts shooting at him, and they all run for the hills, just before the thugs arrive on the scene. I spent a lot of time looking for this particular neighborhood, both in the Valley and in West L.A., only to discover that it isn't a real neighborhood at all. The entire block (including the girlfriend's house) is just a residential street set on the back lot of Downey Studios, at 12214 Lakewood Blvd, in Downey, CA. That's a relatively new studio built on the site of the former Rockwell (and then Boeing) plant, on a triangle of land formed by Lakewood Blvd, Bellflower Blvd and Imperial Highway. They also filmed the 2004 Tim Allen comedy "Christmas with the Kranks" on this same residential street. After Dale & Saul make a disturbing stop at the home of Dale's girlfriend's parents (with Jones's thugs hot on their trail), the girl's frightened family holes up at a motel. According to Dale, this is supposed to be "the downtown Day's Inn". Well, it is a Day's Inn, but it's not in downtown... unless you mean downtown Downey. This particular Day's Inn can be found at 11102 Lakewood Blvd, in Downey, CA, on the same property as the Stonewood Shopping Center. That's at northeast corner of Firestone & Lakewood Blvds - hence the name of the mall: Stonewood. It is also just half a mile south of that historic McDonald's that we see at the start of the movie. Next, we see Dale in a phone booth, phoning his girlfriend Angie at that Day's Inn. She is naturally angry about the crazy situation; they get into a fight and break up. Later, after Saul makes a call from the same booth. As you might expect, the phone booth doesn't really exist (how many old-fashioned phone booths do you see nowadays? ), but the spot where they set up the booth is real enough. You'll find the spot between 3554 W. 1st St. and 3560 W. 1st St., in central Los Angeles, just a couple of blocks southwest of Saul's apartment house. In the photo below, the camera is looking south. The white building seen to the left of the phone booth is an auto repair place that used to be called (fittingly enough) "Red's" (at 3554 W. 1st St). It's now called "Top's Repair & Transmission". (And yes, that mural on its side is real.) The smaller, yellow building to the right of the booth is a fast food restaurant called Teriyaki House (at 3560 W. 1st). Both businesses are on the south side of 1st Street, between N. Vermont Ave (on the west) and S. Bimini Place (on the east). Saul starts to light up a joint, and Dale yells at him about how drugs are messing up their lives. Dale & Saul then get into an argument, Dale hurts Saul's feelings, and they separate. We later see a grieving Saul sitting on a park swing, openly weeping while he eats a hamburger. This scene was shot at Loren Miller Park, a small neighborhood park on the same residential street as Red's house (but about four miles away from the phone booth). You'll find the park at 2717 Halldale Ave (at the southeast corner of Dalton Ave & W. 27th St., just north of Red's house, but on the other side of the street.) The swing set is just south of the tennis courts. That's about five blocks south of the Santa Monica (10) Freeway, between Western & Normandie. Saul makes the mistake of going to see his 'Bubby' (his grandmother) at her "Pointe Break" retirement home. When Saul arrives, he finds that Ted Jones's two thugs have beaten him there, and are talking to his Bubby when he walks in. They spot him and chase him. He hits one with a coffee pot, but they nab him. Afterward, Dale shows up just in time to hear Bubby tell the cops that Saul was kidnapped. This was one of three scenes shot inside the South Bay Daily Breeze newspaper, at 5215 Torrance Blvd, in Torrance. But instead of the former press room (where they film the lab scene), they shot this pool scene in the newspaper building's former atrium. The movie reaches its climax inside an old barn, out in the middle of nowhere, what Ted Jones refers to as "the farm". It's the same place we saw at the start of the movie (in the B&W flashback) - and the barn appears to have been built right over the former spot of that government secret lab, that we saw in that flashback. In fact, we watch Jones's men walk down stairs leading from the barn down to that hidden, underground lab - which they have now converted into a secret pot farm. You won't find the barn anymore - the producers built it especially for this movie, and then blew it up for the climax. But the spot where it was built is none other than Ahmanson Ranch again, otherwise known the Upper Las Virgenes Canyon Open Space Preserve., a 3,000-acre public nature preserve in the hills north of Calabasas and west of Hidden Hills, the same place they shot the opening sequence, and the same park where they filmed the scenes set in the woods. You'll find the park's main entrance at the far north end of Las Virgenes Road, in the foothills of the Santa Monica Mountains, near Agoura Hills, CA. Beneath the barn, in the former secret government lab, Ted Jones has built a subterranean pot farm, filled with a literal forest of marijuana plants. The movie reaches its climax here, with a wild & bloody firefight between the guys, Jones's men, and rival Asian drug dealers. These weed farm scenes were filmed back at the same place they filmed the earlier 1937 lab scenes: inside the former press room of the South Bay Daily Breeze newspaper, at 5215 Torrance Blvd, in Torrance. 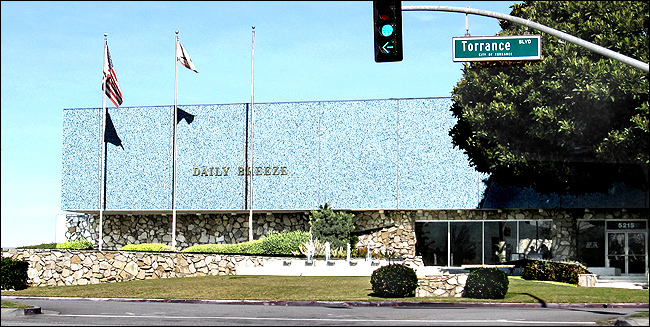 The newspaper had operated out of that Torrance building since 1965, but moved to the nearby South Bay Tower (at 21250 Hawthorne Blvd. ), leaving their old building temporarily empty (pending demolition) and ready for location filming. 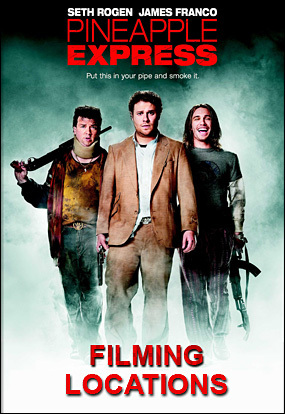 In an interesting twist, during the filming, one of their special-effects fireballs got out of control and set their forest of plastic marijuana plants on fire. The fire department had to show up to put out the flames, and the story made the newspapers - including the Daily Breeze itself. While they were renting out the building, the producers also used it to film the retirement home scenes. and just sort of improvise a rambling conversation about their adventure. located at 30354 Mulholland Highway, in Cornell / Agoura Hills. It's in the mountains, about 5 miles inland from Malibu's Point Dume. and has become one of the most famous biker hangouts in the country. people go there for the atmosphere and the biker culture, not the food. Here is a Google StreetView of The Rock Store.